Ltd. Ed. Tamio Okuda Elitist Coronet™ Custom Outfit Exclusive for Japan! Epiphone welcomes Japan's premier guitarist, singer, songwriter, and producer Tamio Okuda to the House of Stathopoulo with the new Ltd. Ed. Tamio Okuda Elitist Coronet™ Custom Outfit, available exclusively in Japan. Featuring two Gibson USA P-90 pickups and the historic Epiphone Coronet™ profile with a beautiful vintage style Silver Fox™ Nitrocellulose Lacquer finish. 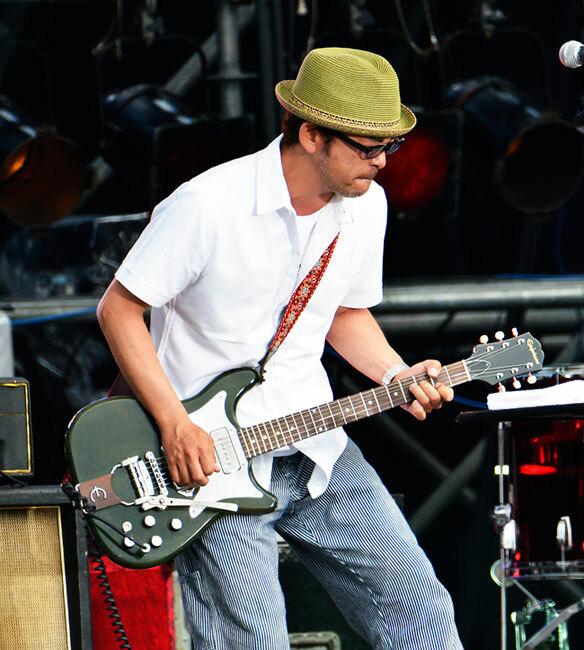 Tamio Okuda is ranked among the top artists in Japan and fittingly, Tamio chose the classic Epiphone Elitist Coronet as his debut signature model and customized it with two Gibson USA P-90 pickups to be the first Epiphone Coronet with two pickups in a stunning Silver Fox™ finish! "This guitar is incredibly lightweight and easy to play with high quality and solid body tone," says Okuda. 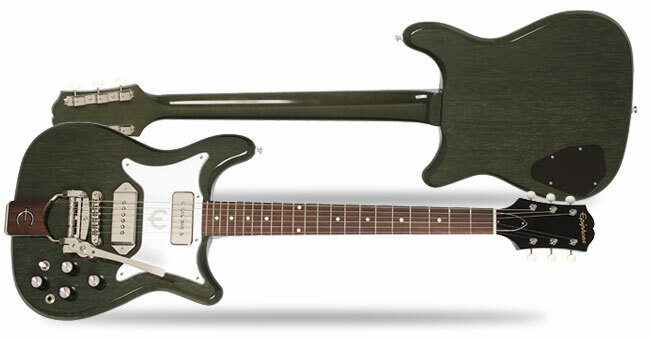 The original Epiphone Coronet was one of the first solidbody guitars made at Epiphone in the late 50s after merging with Gibson and moving to the legendary factory in Kalamazoo, Michigan. The vintage Epiphone Coronet was made at the same time as the ES-335 and the Les Paul Standard, and has since become a Rock & Roll classic all its own. 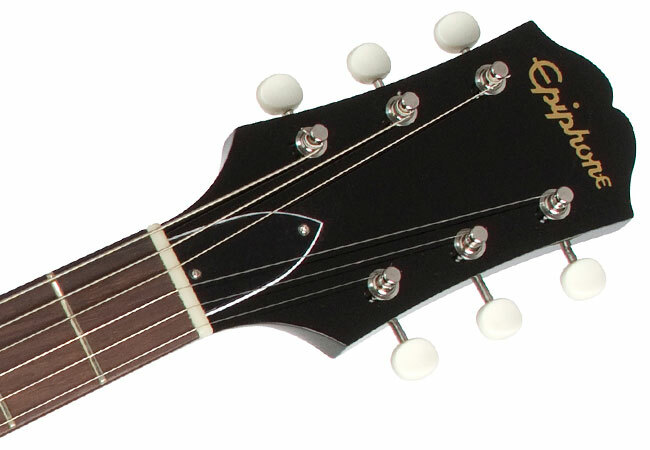 Epiphone Elitist instruments have a worldwide reputation as some of the finest vintage reproduction guitars ever made with exacting standards to finish, electronics, neck profile, and most of all, sound. Working with Epiphone's famed luthiers in Nashville, Tamio Okuda customized his debut signature Coronet to fit his incredible style. Now, the new Ltd. Ed. Tamio Okuda Elitist Coronet Custom Outfit features a rare Silver Fox™ Nitrocellulose Lacquer finish and not one but two classic Gibson P-90 pickups--one "Dogear" P-90 single coil pickup like the traditional Coronet plus a "Soapbar" P-90 for a truly signature instrument that ranks with the most beautiful Epiphones ever made from any era! 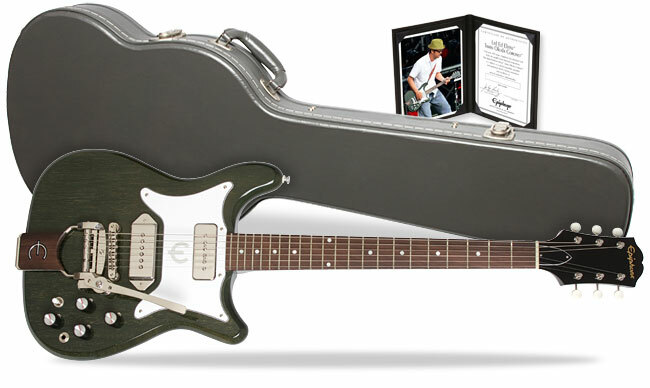 Classic Coronet, Modern Sound: The Epiphone Ltd. Ed. Tamio Okuda Elitist Coronet™ Custom Outfit was designed at Epiphone's headquarters in Nashville, Tennessee and is made at the world renown Epiphone Elitist factory in Japan and features a classic Coronet body made from 1-piece African Mahogany with a vintage style white pickguard with a stunning vintage-perfect Nitrocellulose Lacquer finish in Silver Fox™ upon request by Tamio Okuda. The Tamio Okuda Elitist Coronet Custom neck is also made from 1-piece African Mahogany and is shaped with a 1960's SlimTaper™ D profile. The 12" radius fingerboard is made from Indian Rosewood and has a 24.75" scale length, 22 medium jumbo frets, and an Epiphone 1.62" oiled bone nut. Gibson USA Pickups: Tamio Okuda chose world famous Gibson USA pickups for his signature Elitist Coronet Custom adding the unique combination of a 50s style "Soapbar" P-90 single coil pickup in the neck position plus a "Dogear" P-90 in the bridge position. Gibson USA P-90 pickups are a true recreation of the first generation of P-90 pickups found in the earliest Les Pauls and classic archtops. Gibson USA P-90 single coil pickups are individually voiced for rhythm and lead and provide a huge variety of sound choices for the modern guitarist. The new Ltd. Ed. Tamio Okuda Elitist Coronet™ Custom Outfit may be all you'll ever need to take to a gig from now on! The Ltd. Ed. Tamio Okuda Elitist Coronet™ Custom Outfit also features premium electronics including a Switchcraft™ 3-Way Pickup Selector plus world class CTS™ 250K Audio potentiometers with Orange Drop 473 capacitors. 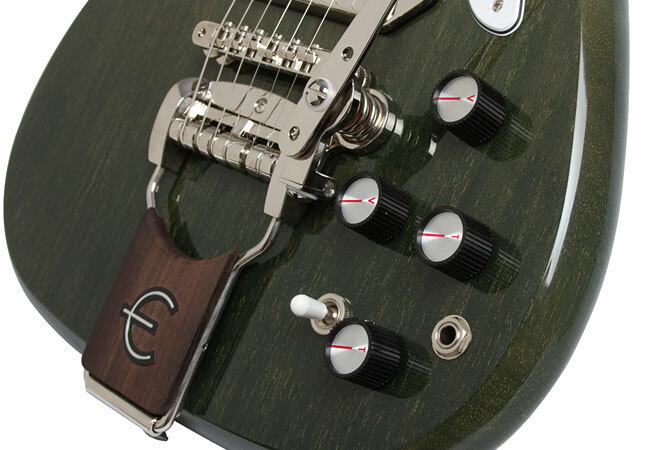 Controls for each pickup's volume and tone feature a recreation of the original Epiphone Vintage "Barrel" knobs. Solid Epiphone Hardware: The Epiphone Ltd. Ed. Tamio Okuda Elitist Coronet™ Custom Outfit features a time-tested rock solid ABR Tune-o-matic bridge and a reissue of the vintage classic Epiphone Trem-o-tone™ vibrato with subtle improvements made to the original mechanism that make it smoother and more reliable than the original. 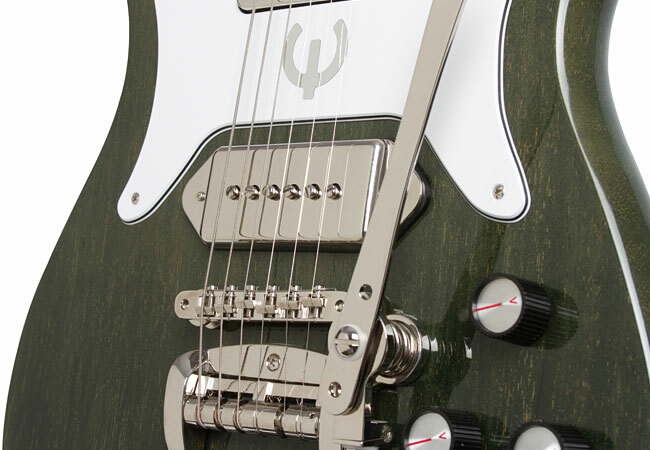 All hardware is solid Nickel and tuning and set up is easy thanks to Gotoh Vintage 3-in-line machine heads with Ivory style buttons. 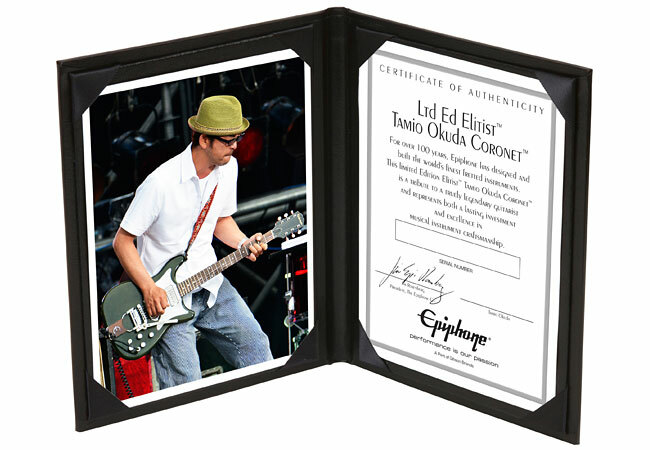 The Tamio Okuda Coronet also comes with D'Addario™ EXL-110 10-46 strings and a beautiful vintage-style hard case with gray exterior along with a Certificate of Authenticity signed by Tamio Okuda! 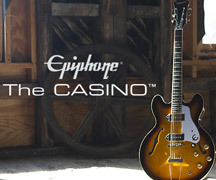 Like all Epiphones, the Ltd. Ed. 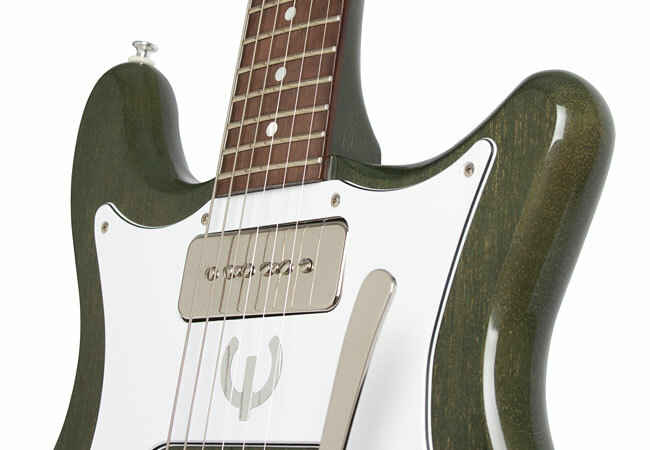 Tamio Okuda Elitist Coronet™ Custom Outfit with a Silver Fox™ Nitrocellulose Lacquer finish comes with Epiphone's Limited Lifetime Warranty and world famous Gibson Customer Service available 365/24/7. 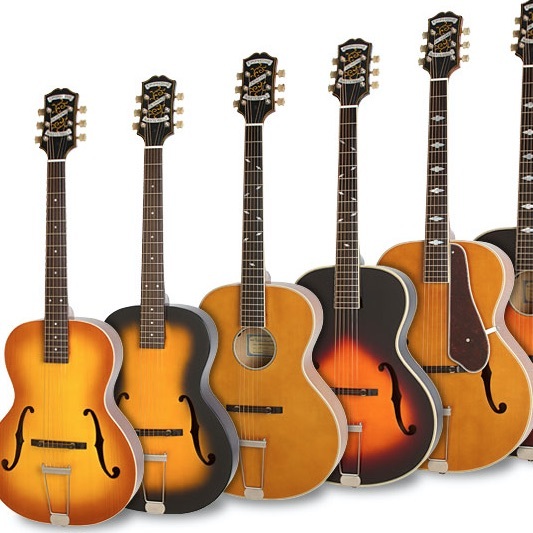 Visit your favorite Authorized Epiphone Dealer and discover the Epiphone Ltd. Ed. Tamio Okuda Elitist Coronet™ Custom Outfit exclusively made for Japan! Find out more about Tamio Okuda at okudatamio.jp.